Teeth that get damaged, decayed, chipped, or fractured become weaker and are more susceptible to infection from bacteria. Dental crowns are an effective option to restore the strength of your tooth and prevent any additional damage from occurring. Your dental crown will be made of the finest quality porcelain to ensure a beautiful, natural looking result that blends in seamlessly with your smile. Your dental crown will encase the visible portion of your tooth, enabling Dr. Frank to improve the appearance of your tooth while providing the protection you need. The best way to determine whether a dental crown is the right restoration for your oral health issue is to speak with Dr. Frank in person. Please call 201-792-9400 today to schedule your consultation at our Hoboken dental office. Improved appearance – Your dental crown restoration will provide many cosmetic benefits and look just like a natural tooth. For this reason, it is often recommended as part of a smile makeover. Improved chewing ability – Your dental crown can restore your ability to chew most foods, enabling you to eat what you want without worry. Improved support – Your dental crown can provide support and protection to a chipped or fractured tooth. Improved bite – Dental crowns can fix alignment issues caused by missing or misshapen teeth to restore a balanced bite. Hoboken cosmetic dentist Dr. Frank DePaola uses all-porcelain crowns with all of his patients. Dr. Frank can match the shade of your dental crown with the color of your natural tooth and since dental porcelain mimics the translucent properties of tooth enamel, your restoration will have a beautiful, natural looking appearance. All of our dental crowns are custom crafted at Williams Dental Lab. Dr. Frank works exclusively with Williams Lab because they consistently produce exceptional quality restorations. Your dental crown procedure can be completed in two visits to our Hoboken cosmetic dentistry office. 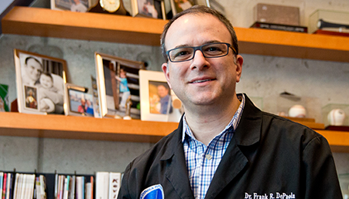 At your first appointment, Dr. Frank will remove any decay and prepare your tooth to accommodate the dental crown. An impression of your tooth is taken and sent to Williams Lab for use in creating your crown. Dr. Frank will place a temporary crown on your tooth to protect it while your permanent restoration is being constructed. 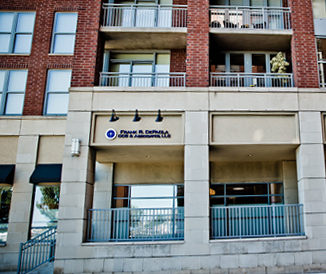 Once your dental crown has been made, you will return to our office to complete the procedure. Dr. Frank will bond the crown securely to your tooth and make sure your bite is properly balanced. For additional information, please read our Questions about Dental Crowns page.